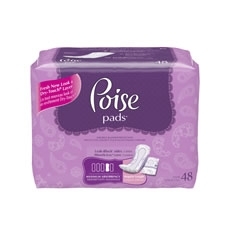 Kimberly Clark Poise Pads Maximum Absorbency Long feature a fresh new look and Dry-Touch layer to keep skin free from moisture. Offers discreet bladder protection with a comfortable fit. Pro Advantage Alcohol Based Hand Sanitizer Pro Advantage Adult Wipes Huggies Natural Care Baby Wipes Pro Advantage Non-Adherent Sterile Pads 3"x4"